HANK PHILLIPPI RYAN: Thanksgiving 19...75? May have been the most revealing ever. Backstory: Every year that I could remember, we had two turkeys, and my mother made two kinds of stuffing. One turkey had the good kind, plain, from Pepperidge Farm, with the addition of sauteed celery and onions, which of course is the perfect stuffing. More on that in a minute. We DIED, even thinking about it. As a ten year old, when my sister Nina was seven and Nancy was five, we would watch Mom put the oysters in the dressing and then hold our tummies in pretend agony. HOW, we wailed, could anyone eat that stuff? We were so grateful that there was the whole other turkey that had delicious plain stuffing. So fast forward until 1975, when I was a nicely grown up twenty- something. I was back home in Indiana, in the kitchen, smelling all the Thanksgiving smells as Mom made the traditional two turkeys. She made up the big bowl of stuffing, it smelled fabulous, and then proceeded to dump the can of oysters into the big ceramic bowl. MOM! I yelped. You put oysters in the whole thing! Well, I was shocked. Parental deceit, and at holiday time, too! But—we happily ate it again. And the oyster stuffing story is one of our holiday traditions. Liz loved the cranberry sauce from a can, you know, the kind where you could see the ridges? Yuck, but chacun a son gout. And we also always had black cherry Jello with black cherries in it. 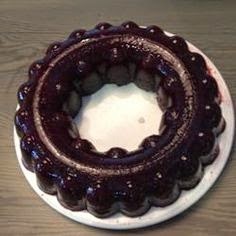 Weird, dark dark red jello, made in a bundt cake mold, with marble-sized black cherries floating in it. "Black cherry" is a kind of weird flavor not found in nature (I guess Bing cherries are the closest) but if my mother tried to serve Thanksgiving dinner without Black Cherry Jello mold, my little brother Chip (now a handsome and dashing attorney--age 55--in Colorado) would have a fit. We ALWAYS had Jello. So what about you, Reds? And Thanksgiving must-haves, deceptions, or family necessities? DEBORAH CROMBIE: This is Texas, so cornbread dressing is a MUST. With lots of sage, celery, and onion. I love my cranberry relish recipe, although I suspect that no one else likes it as much as me... My daughter and I LOVE fresh Brussels sprouts, sauteed with bacon, but we are in the minority. My aunt still does Thanksgiving dinner, and there is no weird jello, thank goodness! HANK: Hey, talk to Chip! And Brussels sprouts are now a definite necessity, I’m with you. 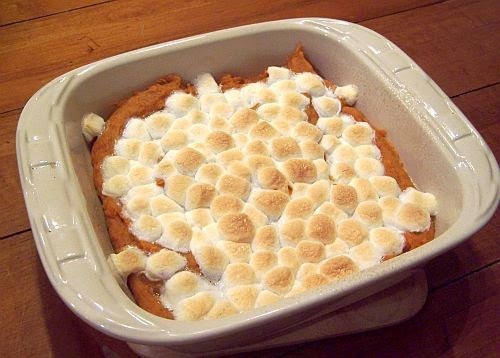 RHYS BOWEN: The one thing I can NOT have is sweet potato casserole with marshmallows on it. I ate my first one when I was pregnant, felt violently ill and can never face one since. 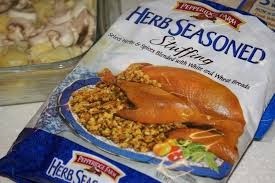 I adore good stuffing with lots of herbs. John likes sausage meat stuffing. Clare makes the best mashed potatoes and everyone insists on the family recipe apple crumble. HALLIE EPHRON: Gourmet family that we are, we require Pepperidge Farm herbed stuffing in our turkey. No oysters or cornbread stuffing for us. It’s got to be from the bag, using the recipe ON the bag and following their suggestion to add onions and celery. should have come to YOUR house. JULIA SPENCER-FLEMING: Now see, I make stuffing from scratch, following the recipe my mother used and her mother used. It's so economical, I suspect it was a Depression-era-or-earlier thing. I take an entire loaf of white bread - cheapo white no-fiber bread we all ate back in 1964. Leave it out two days til it gets nice and stale. Saute onions and celery in butter while boiling the celery leaves, onion ends and carrot trimmings with the turkey neck for a quick stock. Tear the stale bread in pieces, toss with the onion-celery mix, sage, and dampen it well with the stock. You must have enough to stuff the bird and make a separate casserole dish, because everybody knows some people like stuffing wet and some like it dry. Oh, and the must-have from Ross's side of the family? 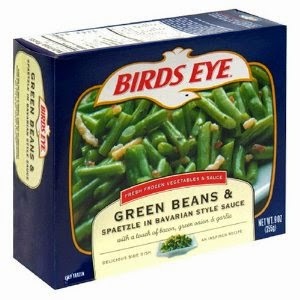 Birds Eye green beans and spaetzle. Not hand-snapped fresh green beans, God forbid, but veggies and sauce frozen in a microwaveable dish. Oh well, at least it frees up one of the burners for my latest attempt at a fancy cranberry sauce that someone might actually eat. HANK: So how about you, Reds? What’s your Thanksgiving must-have? What’s your vote on mashed potatoes? Lumpy or smooth? And sweet potatoes with marshmallows? Yea or nay? And coming up this week: tomorrow, Gravy! Wednesday, cooking secrets for emergencies! And then, surprises. Congratulations on the "Truth Be Told" nomination! Tradition being what it is, our Thanksgiving dinner never changes. Brussels sprouts with bacon and garlic, roasted asparagus. Mashed potatoes can have some lumps, but they have to be made from scratch, mashed with the potato masher and served with giblet gravy [which I never eat]. Yes to the mashed yams with melted marshmallows mixed in, too. Homemade orange cranberry relish; bread-and-butter pickles, black olives, stuffed green olives, celery stuffed with cream cheese and walnuts . . . . I suspect I am in the minority here, but although I make bread stuffing [from my mom's recipe], I don't like it and I never eat it. And that green bean casserole thing that's supposed to be part of everyone's Thanksgiving? That never, ever makes it to our table . . . .
Like Julia, I do the made-from-scratch stuffing just like hers, except I dry the cheap white bread in a 200 degree oven and then convince someone to break it up for me. The turkey neck - ugh, but had to use it. Making everything from scratch was probably for economy also but not using "that bag or box stuff" always seemed better. And getting a small test plate of stuffing before dinner was something to look forward to. I still have one while watching the Rose Parade. And then there were the Jell-o salads: the lime green with Cool Whip, marshmallows and nuts, and the orange Jell-o, pineapple, shredded carrot version. I made those for years until my kids pointed out that was a memory from MY childhood, not one they wanted from theirs. For Thanksgiving and most other holidays (except Passover) my mom would make a Jello mold, a large ring with several layers of different colored Jello and all kinds of fruit (including banana slices serrated around their edges to look like stars and canned pineapple slices with a cherry in the middle) all suspended in the gelatin at even intervals. I wouldn't eat it-- I've never been a big fan of Jello-- but I now realize how much work went into it, and in missing my mom, I miss that Jello mold. When my mom got to old to make Thanksgiving dinner, I would go over to my parents' apartment and do the cooking-- turkey, baked sweet potatoes, dressing (I don't put it INTO the bird, because that can cause salmonella), pumpkin pie and my dad's favorite, lemon meringue (to be fair, I bought the pies, because I don't like pie crust so I've never learned how to make one), and of course, both cranberry relish and Ocean Spray jellied cranberry sauce, with everyone fighting over the slice that had the rings in it. When I cooked for my parents, I would saute the turkey liver with mushrooms and celery for my dad to munch on while he watched the Macy's parade or whatever football game was on TV. Now that he's gone, to the chef belongs the liver. But I'd gladly give it up to have him back again. PS Did all kids grab canned pitted black olives out of the relish dish and put them on their fingertips? Julia and I had the same mother, stuffing wise! Except now I use cheapo whole wheat bread. No marshmallows on my Thanksgiving table, either. My son just brought home two Brussels sprouts stalks from the farm - did you know the top leaves are incredibly sweet? - that we'll roast with garlic and olive oil. Not something I grew up with, mind you! Thanksgiving is my favorite holiday and I'll be blessed with both sons home for it again this year. Louisiana sweet potato casserole with chopped pecans and brown sugar. Doesn't get any better. I add browned sausage meat and parsley to my bread stuffing,with onion and celery. My extended family faces the same dilemma every year: turkey or no turkey? Three of the 11 of us are vegetarians and tend to have influence out of proportion to our numbers. The solution usually is to cook the turkey off-site and bring it to the host's house, sliced on a platter--nothing that resembles an actual bird allowed! The must-have dish for me comes from the original NYT cookbook and it's unbeatable: spinach-artichoke casserole, made with indecent amounts of butter and cream cheese. You can practically hear your arteries closing. And I'm with Deborah on Brussels sprouts--except that I omit bacon and add toasted chopped pecans. If you slice them thinly and sauté fast, they are delicious. Thanksgiving: the best meal of the year, hands-down. Yes! Ellen, we DID put the olives on our fingertips! Hilarious! That's so funny, Grandma Cootie--that the kids want to make their own traditions. Hm. Edith, I love those whole stalks of Brussels sprouts. They grow SO weirdly! Margaret...mmmm. That's one of those main dishes that 's actually dessert, right? Hank, it was probably Ohio at the top of the list for that awful green bean casserole. It was always on our Thanksgiving table and it's one tradition I did not pass on to my kids. Deviled eggs, however, are a must. The NY Times recently published a gorgeous looking recipe for homemade green bean casserole. Made with fresh beans (of course), bacon (! ), creme fraiche, fresh mushrooms... and topped with !crumbled Ritz crackers! Sounds heavenly. And if I were bringing 1 dish to a pot luck I'd do it. Cindy, I bet that press release is in my email somewhere-anyone else see it? I'm thinking about it now--I'm not sure I've ever had green bean casserole! Not SHADED Brussels sprouts, thank you so much spellchecker. SHAVED. Yeesh. Someone else has eaten the orange jello salad with the carrots and pineapple in it! I thought I was the only one! A few years ago, I finally convinced my mom that just regular fruit salad, sans jello, is perfectly acceptable. 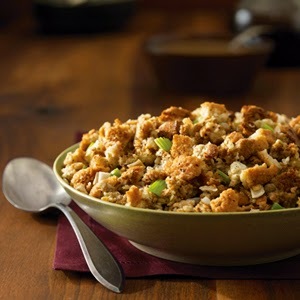 Cornbread stuffing--yes! Homemade mashed potatoes, maybe with mashed turnips mixed in--yes! Gravy, no giblets--yes! Brussel sprouts, of course! Speaking of that, anybody have a great BS recipe that can be served at room temperature? Hank -- I love the story about your mother. It is great on so many levels. Happy Thanksgiving all. Congrats on the award nomination Hank. The first of many, I have no doubt. Years ago, when I started hosting Thanksgiving, I discovered a brined turkey and I was hooked! No stuffing in the bird - no room because it was filled with cinnamon, herbs, onions and sliced apples. Yum. I do homemade stuffing. The kids like a sausage and green apple version, the hubby likes a mushroom-sausage. I used to alternate. Fresh green beans ONLY with crumbled bacon and caramelized shallots - all sauteed in the bacon grease. And we MUST have a homemade pumpkin pie. Unfortunately, last year we started going to my dad's house, so I don't have to cook on Thanksgiving and a lot of things have gone by the wayside. No Jello or green bean casserole, thankfully. And since my stepmom doesn't want me to bring anything, I still make a pumpkin pie (gotta do it tonight, as a matter of fact. Oh mashed potatoes! They can have some lumps, but I discovered making them with buttermilk and a lump of cream cheese - so yummy! I am such a traditionalist when it comes to Thanksgiving...it's just not real unless there's turkey (dark meat for me, please), mashed potatoes, gravy, cranberry sauce (although I have upgraded from the canned jellied stuff to my own cranberry ketchup), squash, creamed onions, and pumpkin pie. And maybe Brussel sprouts, if I feel like it. This year, I'm dealing with a broken double oven where only one...the small one that's 4" high...works. Oh, and I have to space everything out because I had surgery in June, so I'm not quite back to full strength yet. So I'm going to have to get a bit creative to make everything. I'm thinking of trying that "crockpot mashed potato" recipe that's been going around. And I'll start making different side dishes today so that I just have to reheat them on Thursday. Kudos, Hank on the RT Book Reviews nomination for Truth Be Told! I'm not surprised one bit, it's a terrific book - the best Jane Ryland yet! Perhaps this is a topic for another day this week, but my favorite part of the meal is the pies: Apple, pumpkin, pecan and blueberry, too, because, you know, Maine. An absolute MUST in our house for Thanksgiving: the potatoes have to riced. I think it's a Norwegian thing -- leftovers then used to make lefse. I think I have finally convinced my family that, yes, I have a ricer and the potatoes at my house will be riced. They even brought a back up utensil one year that I was hosting. On the way to my speech… And all these are making me hungry! Lucy! I have recipe for you! I will send as soon as I get home… It is too difficult to do this on the phone! Oh, gosh, the green bean casserole is a must at our house twice a year, Thanksgiving and Christmas. I even use three cans of beans so there are leftovers! Tried the substitutes to cut the salt in the beans and soup, but not the same. And yes, I am an Ohio native, but my husband is not! Our family has always done baked sweet potatoes with marshmallow topping. I scrap the topping off. Yuck. Too sweet. It's hubby's family that does the green bean casserole and the broccoli-rice-cheese casserole. Never liked it until last year, when my sister-in-law made it all from scratch, with good cheese. It was delish. Hank -- a potato ricer looks like a large garlic press. It has two long handles, one with a perforated basket at the end, the other with a flat surface that fits into the basket. The cooked potato is placed in the basket, then the flat surface is pushed down into the basket by pressing the handles together, forcing the potato through the holes, which are typically about the diameter of a grain of rice. The potatoes are fluffy but not mashed. There is an entire episode of Buffy the Vampire Slayer that deals with riced potatoes. My sister, a Buffy fan, went out and acquired a ricer. I have two or three-- one bought at Good Will or a rummage sale, two found at the cottages when I was getting all the stuff out of them. Oysters in stuffing? Yuck! Of course, I hate sea food. We usually follow my mom's recipe, which is delicious and made from scratch. We are a two sweet potato dish family. There's the one my family traditionally has, which is yams, apples, raisins, cinnamon, and lemon juice layers and baked. It's delicious. My sister-in-law's family makes the ones with marshmallows on the top, so she started making that one as well. At this point, we love them both and it wouldn't be Thanksgiving without both of them. I see that Pepperidge Farm dressing mix is not just my dirty little secret. And Deb, no cornbread ever makes it into my dressing, nor do oysters although I bet I'd like them. I grew up on giblet gravy, but my partner Julie says no "parts" allowed in the gravy. A couple of years ago I pureed the giblets and added them to the gravy anyway. No one knew the difference except that it was declared the best gravy EVER! As all you writers of mysteries know, a little deceit is sine qua non for a good read or a good gravy. I just love it when we talk about food! Gotta haves - Lots of Pepperidge Farm dressing. Mashed potatoes (smooth, please - and lots of them), sweet potatoes with lots of toasted marshmallows on top, gravy (lots and lots of gravy), big fluffy rolls with lots and lots of butter. Oh! and Turkey. I love reading all about these food traditions. I'm all for the Pepperidge Farm dressing. I cook the turkey neck & that's added along with the celery and onion. I used to have to make a separate dressing for my vegetarian brother-in-law if he was joining us. We now eat at my daughter & son-in-law's home about every other year. He's the main cook in that family & cheats when it comes to the gravy - straight from a can. The turkey is good, the mashed potatoes real. Both my daughters prefer the cranberry sauce from the can so I gave up that battle long ago. Occasionally I make cranberry bread. What I miss most from the old days when I was a child are the rolls made by my aunt for the larger family gatherings. Nothing equals them, ever. Congratulations on the nomination, Hank! I don't have any must-haves for Thanksgiving. We didn't do a traditional turkey day when I was growing up because my dad owned restaurants and, well, we dealt in food all the time. My mom DID NOT want to cook all day--and she doesn't like turkey, and, besides, we didn't have extended family. We'd have filet mignon! Well, Hank, you will appreciate the one dish that I have to make for every Thanksgiving and Christmas dinner, scalloped oysters. My mother always made these, and the family fell into two camps, those who loved the oysters and those who love just the buttery cracker filling. I fell into the latter group. With my mother gone for almost twenty years now, her oyster dish has lived on with my family, my brother's family, my sister's family, and even my brother's ex-wife's family. 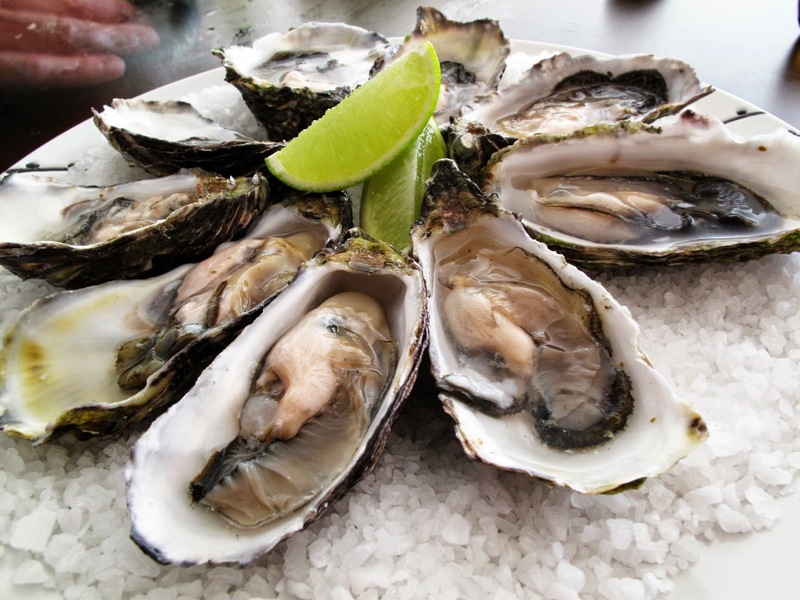 I now will allow a bit of oyster into my helping, but it's still the filling that is the best for me. Another staple at holiday dinners growing up was dressing balls. My mother made dressing/stuffing from scratch (white bread and all) and then made it into balls and baked it. My best memory of holiday dinners is after the main dinners and in the days following when I would warm up the dressing balls in gravy. Nothing better in this world. As I look back, I now realize just how many dressing balls my mother must have made to have leftovers. Alas, I have never mastered duplicating my mother's recipe, but I've been told that my brother has, so I guess I need him to tutor me someday. If we lived closer, we could join forces and I could eat them at his house. Then another must-have was corn pudding. Well, when I moved to the other side of the state, to western Kentucky, these people weren't familiar with it. I've only made it a few times at holiday dinners, but my family back home still religiously fixes it. I might make some for a weekend meal after Thanksgiving this year. One more gotta-have-it that has continued from growing up to my family now is country ham. Now I know that many people think they know good country ham, but if you haven't had it from my hometown at a little old grocery shop that's been there since the 1800s, then, unfortunately, you haven't had truly delicious country ham. Cissy at Hutchison's in Maysville, KY sends her ham out all over the country to those of us who no longer live there. I always order at least 8 pounds, and at $15 a pound this year, it's expensive, but worth every penny. My father used to cure his own hams, and my mother would bake them with cloves producing a heavenly smell in the kitchen. Of course, I haven't forgotten turkey. There has to be turkey, too. These days, I farm out the cooking of the turkey to one of the local restaurants, Old Hickory Bar-B-Que. They don't put bar-b-que sauce on it, just smoke it. Yum! Then, there's the choice of broccoli casserole with Velveeta cheese and Ritz crackers or asparagus casserole the hard-boiled eggs, saltine crackers, and Velveeta cheese/juice from the canned asparagus sauce. And there's always butter in the casseroles. As I say, buttah makes it bettah. And, mashed potatoes is just a no-brainer, like putting salt and pepper on the table. They just appear. LOL! OK, last item that is a new tradition since I married, 38 years ago. Homemade pumpkin pie, using canned pumpkin. I grew up hating pumpkin pie, but my mother-in-law's recipe uses one can of pumpkin for two pies, so it's not in-your-face pumpkiny. Hank, congratulations on the RT Book Reviews nomination! Truth Be Told is such an exceptional book! If I went to my Irish grandparents' for Thanksgiving it was pretty Norman Rockwellian, but if I went to my Russian-Polish grandmother's it was all about turkey stuffed with kielbasi and blood pudding—unless it was my grandfather's turn to cook, and we had pork pie and something he called turkey, but I didn't believe him. I'm pretty sure it was salmon and mushy peas. I feel like I'm part of several of your Thanksgiving dinners. My mom made the Depression era stuffing, setting the bread out to dry for 2 days and then adding the celery & onions with spices. I do that, but Pepp Farms is a great optional time saver. Mom also used to make the oyster stuffing, but thankfully never fooled us (at least I don't think she did, too late to ask now, she's been gone 15 years! ), making it in a separate pan. 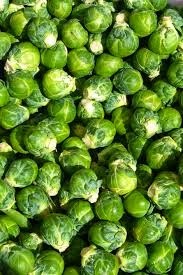 We never had Brussels sprouts (one & only time I ever ate them was at friend's Thanksgiving dinner - they were yuck! ), green bean casserole and mashed potatoes w/gravy were our standard sides. Always pumpkin pie and Coolwhip. My grandma used to make a cranberry sauce, alas the recipe was not saved, so no idea how it was made. My husband loves the canned stuff. I eat my turkey sans sauce, but do love gravy. I enjoy doing the whole bit myself, but this year we are going to a friend's. I am bringing pumpkin pie & Coolwhip, green bean casserole and a salad. Enjoy all your dinners!! Its not that I don't love oysters...I do! Fresh, cold, with red sauce and lemon and horseradish. But I don;t like them when they are yuckily hiding the in the stuffing. Well, wait. I guess I DO like them in stuffing. Because I ate them every year since I was 10! And Barbara, that's one of the loveliest thing about hanging around here at the Reds... it does feel like a family, and every time we share memories, there are so many similar ones! I mean--Jello! Who'd a thunk? With 30 million green-bean casseroles set to appear on Thanksgiving tables next week, I'm writing to suggest a story for WHDH-TV on a fun holiday survey: "Massachusetts is ranked #17 in the U.S. for love of green-bean casserole, according to the Del Monte Green Bean Index." To conduct this study, bean counters at Del Monte -- the country's preminent grower, distributor, and marketer of green beans and many other delicious vegetables -- asked 1,500 Americans to "go green bean" and rate their fondness for the classic green-bean casserole side dish. Who even knew there was a Del Monte Green Bean INdex??? I can't believe Ohio was #16. I'd have guessed much higher. That dish turns up everywhere! And yeah, Cyndi, HILARIOUS, huh? And Char-I am so sorry about your oven! That is very frustrating...Let us know how the crockpot mashed potatoes turn out! I live in WI (#2) and have never tasted (or seen in person) a green bean casserole. Next year, green bean casseroles for EVERYONE! We will all make them, what do you say? So, my state, Kentucky, is #1 for the green bean casserole. I guess that's good? I much prefer a broccoli casserole or an asparagus casserole. Another dish that was always on our menu growing up was a frozen fruit salad. Anybody else have that? It was delicious. The cherries in it were my favorite. Hank, I'm in for trying green bean casserole again. The first time I made it I did it all wrong, and no one liked it. Apparently you have to use canned string beans, canned soup, and canned onion rings—or the recipe doesn't come out right. I thought I'd be clever and use fresh. Ha ha. Silly Moi. Hank, don't forget to tell us about the brussel sprout recipe! I think I want to try Hallie's green bean casserole . . . . This is absolutely so delicious, and people will be so happy while they're eating it! The key is, if you have finicky eaters, don't tell them what's in it… it's way too healthy. My sister Nancy is a chef and she introduced me to this—she says at the parties she gives, people talk about this salad for days! This recipe makes enough for about six people, but don't be afraid to extend it. Once you make it, you will see the proportions that work for you… And of course, more cheese is always good. It's a fabulous crunchy nutty cheesy side dish for turkey--because it is cold, you can make it in advance. The key is to cut the Brussels sprouts very very very thin. They should be shredded. And yes, use them raw. You can add pepper to taste, but you do not need to add salt. The cheese and the nuts are salty enough! Trust me… This is absolutely fantastic. And your guests will be guessing the ingredients! Clean and wash sprouts, then shred them very very very thin—it should look like the familiar cole slaw. Hallie, I might go looking for the recipe that you used. It sounds great! Still my children probably wouldn't like it if it isn't canned. Don't know where they got that! School? Night, everyone..see you in the AM forbGRAVY! ONE bag of mini marshmallows or One bag of reg size marshies cut up as below. Sweet peas, mashed taters, corn, gravy, rolls, butter, applesauce, turkey, dressing, Gram's recipe", cranberry sauce, always had to have a canned on too as I did not like chunky Cran sauce when I was little. No one had to cook for at least a week!! !